The pancake-waffle debate has not been as widely publicized or polarized as the Great Cake-Pie Schism that has defined the past decade. And while my fear of alienating readers means I won’t touch that particular issue with a 10-foot spatula (though I do keep one of those in my kitchen at all times), I can safely say that I am proudly pro-pancake. Also, I love alliteration. 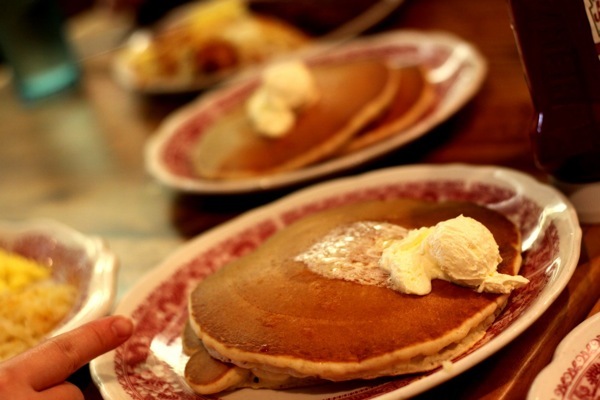 The great thing about pancakes is that they are like the little black dress of breakfast foods. Dress them up, dress them down, throw a belt and some sparkly flats on there (note: do not actually do that)… they always taste great. For this reason I am including the full spectrum of pancake possibilities. First, a basic buttermilk recipe, which you can add to and doctor almost infinitely. Second, a method of adding a layer of molten Nutella to your pancake experience. And thirdly, for those whom, for whatever reason, aren’t entranced by a pancake filled with chocolate-hazelnut lava, there is the slightly more complex and significantly healthier Apple-Cottage Cheese Pancakes. Start by heating frying pan over medium heat. Mix eggs and buttermilk together in medium sized bowl. Sift in the flour, baking soda, and salt. Stir gently. Add brown sugar. Let batter sit a few minutes as you butter the pan. Use about 1/3 cup batter for each pancake, pouring them into the hot pan but being careful not to crowd it. Cook each pancake for about 2 minutes, until there are bubbles dotting the surface. Flip with a spatula and cook for another 1-2 minutes on the second side. Recipe same as above. However, once you have poured the pancake in the pan, drop a dollop of Nutella in the center of the pancake. As the first side of the pancake cooks, the Nutella will heat up and spread out, and by the time you’re ready to flip the thing, you’ll have a nice, warm chocolate pocket up in most of your pancake. Combine all other ingredients (except toppings and frying oil) in a medium-sized bowl and mix well. Fold in the egg whites. Heat oil or melt butter in a skillet. When it is hot enough to sizzle, drop of batter on contact, add spoonfuls of batter. Fry on both sides till firm and lightly browned. Serve right away, topped with syrup, sour cream or yogurt, and/or berry sauce.